Stay in the sea cottage do not have all the way to the Maldives. In Gorontalo there is a unique resort that is not less cool than in the Maldives. If vacationing in Gorontalo Province a famous destination for the beauty of the sea besides Olele Beach is Pulo Cinta Eco Resort. 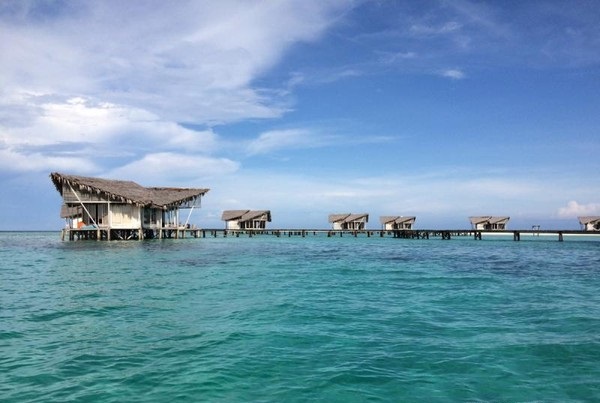 Pulo Cinta is often referred to as Maldives of Gorontalo karna inn in the form of cottages that stand on the beach, so when open the window directly facing the sea. Pulo Cinta location is located in Patoameme, Botumoito, Boalemo District, Gorontalo Province, and can take approximately 2 hours from Gorontalo Airport. Due to its location in the middle of the sea tourists have to take another boat trip to the resort. Why is Pulo Cinta named? Because the location is in the middle of the beach that has a heart-shaped embossed sand. According to the story of the local community was once a place to blend the love of a young couple then his love love did not get the blessing of his parents. Eating the island is called Pulo Cinta. Pulo Cinta Eco Resort has 15 cottages that have some bedroom capacity. The cottages are divided into 3, namely cottages that have 1 bed, 2 beds and 3 beds, so tourists can adjust the capacity of the bed and the number of people who come. In Pulo Cinta is not uncommon that comes a new marriage partner, because the place is far from urban and romantic atmosphere. Tourists can enjoy the beautiful sunrise and sunset directly from the bed. In addition to the beauty of the beach, tourists can go directly to the sea just swim, water and snorkeling because the beauty of the sea is inhabited by various kinds of marine life and coral reefs. But if the night comes cold air can be felt directly because the building structure is made of 100% wood and has a roof made of shingle and straw. Prices are pegged at around 3.5 million to 5 million per night. Because the place is limited and the demand is very much, tourists are encouraged to book the place first. Not only local tourists who come here, also a lot of foreign tourists. 2 Responses to "Feel at the Maldives, whereas in Gorontalo Indonesia"
It feels so excited travelling to the Maldives to enjoy beautiful places then fly to visit wonderful Indonesia and capture wonderful moments there. Vacationing in Gorontalo Province Maldives would be great idea to take a tour of beautiful places and have some fun out there.